From left to right: Nicole Mead, Chief Financial Officer, OCN, Judy Head, I/Director of Administration, OCN, Zacc Moore, CWO Manager, OCN, Onekanew (Chief) Sinclair, Art Barbeau (shaking hands), Salman Safdar (Black Jacket), Usman Tahir (white shirt). Photo courtesy of OCN. The Opaskwayak Cree Nation (OCN) Blizzard has new ownership. But the local businessmen who purchased the Junior A club must now wait for approval from the Board of Governors from the Manitoba Junior Hockey League (MJHL) to make the deal official. This marks the 22nd season of operations for the Blizzard. For all but one of those years the franchise has been run by the Opaskwayak Cree Nation. Christian Sinclair, who has been the chief of the First Nation since 2016, believes the time has come for his community to get out of the business of operating a junior hockey franchise. “I’m there to do what’s best for our people,” he said. Sinclair estimates the First Nation has been pumping in about $1 million per year to run the Blizzard. He said he can’t justify that kind of money especially when his community has more pressing needs. 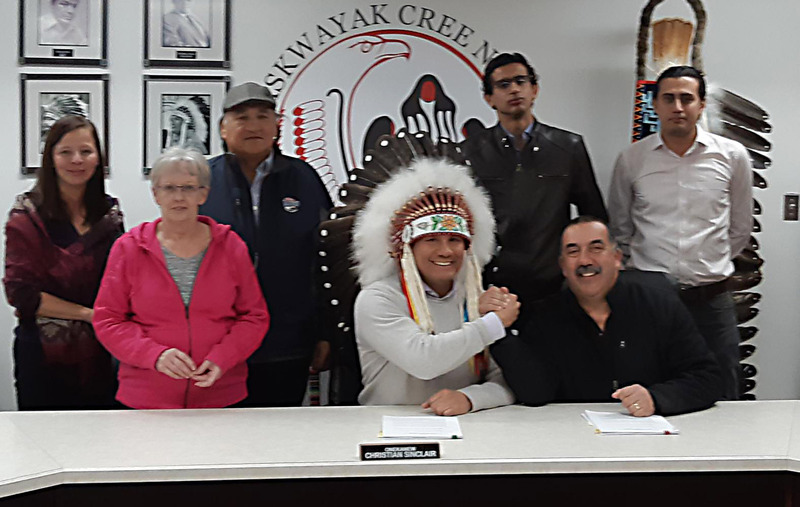 It was announced at a news conference this past Wednesday that the Opaskwayak Cree Nation had sold its hockey franchise to three area businessmen. They are Arthur Barbeau, Salman Safdar and Ulman Tahir. The sale of the club, however, is not official. That’s because it need to be approved by the MJHL’s Board of Governors. Davis added he would have preferred if OCN officials had kept the sale of the club a secret until it had been approved by league reps. The next scheduled meeting for the MJHL’s Board of Directors is March 30 in Winnipeg. “But the board can meet at any time,” Davis said. That’s not to say though that the Blizzard sale can be approved overnight. “Once we get an information package (about the sale and transfer of the squad), we will give our board members a two-week period so they can review it,” Davis said. Davis said he can’t speculate on how the governors will vote in regards of the Blizzard sale. News of the sale of the team was hardly surprising for Davis. “It’s fairly common knowledge that the team has been struggling financially,” he said. In December 2016 it was announced that the OCN council would no longer fund the Blizzard after the completion of that season. With that announcement it appeared the franchise would fold. But a Save Our Blizz campaign kept the team alive last season as community support allowed the squad to compete during the 2017-18 campaign, while being run by an independent board. Sinclair said the Manitoba city of Thompson had previously offered to take over the Blizzard after the First Nation had originally disclosed it was planning to discontinue its support. “But then this independent board came in and said give us a year to see if we can salvage it,” Sinclair said. The First Nation once again took over running the club this season. Sinclair is thrilled area businessmen have stepped in to take over the Blizzard operations. Sinclair doesn’t mind the fact the sale of the team was announced before the league’s Board of Governors approved the deal. “It allows them to prove to the governors they can do it,” he said. Sinclair added he is hoping the Blizzard succeeds. In fact, the First Nation’s council will still be assisting the club. Sinclair said his council has agreed to waive all ice rental fees and the charges of dressing room expenses for the Blizzard. That in essence amounts to a sponsorship of the club to the tune of about $165,000 per season. The Blizzard has had its share of on-ice successes over the years. In fact, the team won five consecutive league championships from 1999 to 2003. The OCN squad though is somewhat struggling with its performances this season. Following its first 44 contests the club is sporting a 16-26-2-0 record. With this mark the squad is occupying 10th place in the standings of the 11-team league.